In a landmark judgment, the Supreme Court of Appeal has ordered the City of Johannesburg to compensate 27 homeless people for unlawfully confiscating and destroying their property, according to a GroundUp report. The homeless applicants lived on a traffic island under the R31 Highway Bridge in the Johannesburg Central Business District. Most had stayed there for about two years. They used cardboard boxes, wooden pallets and various materials to erect temporary shelters on the traffic island. Every morning, they would dismantle their makeshift homes, leave behind many of their personal belongings and go off in search of food and work. Twenty-two of them earned between R350 and R1 000 a month collecting recyclable material. One day, officials of the Johannesburg Metropolitan Police Department (JMPD) descended on the traffic island settlement. They pepper sprayed some of the homeless people, verbally abused them and without a court order removed their personal belongings, piling them in a rubbish truck. Nigel Branken, a member of the public, filmed the officials removing mattresses, rucksacks, suitcases, and blankets. The metro police say it was part of a clean-up operation conducted after numerous complaints from local businesses and the public. People had complained about public defecation and urination, excessive rubbish and waste, as well as the use of drugs and criminal activity. The municipality argued that it faced a crisis with numerous homeless people appearing in locations throughout the city. To address this, it had established a sub-unit within the Department of Social Development to find shelter for homeless people, offer skills development and drug rehabilitation programmes. Twice a week it would inform the applicants of a nearby shelter. However, staying at the shelter required a person to have an identity document and to pay R8 per day. The JMPD and municipality said they had simply removed the rubbish and any personal items confiscated would have to be preserved and inventoried. The applicants, represented by Lawyers for Human Rights, approached the Gauteng High Court for relief requesting it to declare that the metro police and the municipality had unlawfully evicted them from their homes and was obliged to return their belongings, or at the very least compensate them. The court rejected the argument that the applicants’ homes were demolished because the applicants had conceded that they dismantled their homes themselves every morning. It found that sleeping habitually at a traffic island did not constitute "occupation" within the meaning of the law. Therefore there was no eviction. The court found that because the "confiscated" items had been inadequately described or had in any event been destroyed, these could not be returned. Instead, the court said the applicants could institute a claim for damages. It reprimanded the municipality and told it to implement better processes when conducting clean-up operations. Unhappy with the decision, the applicants appealed to the Supreme Court of Appeal (SCA). The SCA had to decide whether the makeshift structures and temporary shelter at the traffic island constituted a home, whether the clean-up operation constituted an eviction, whether the applicants were entitled to a constitutional remedy, and whether the applicants were entitled to punitive damages. In order for an eviction to take place, the makeshift materials of the applicants had to constitute a "building" or "structure". The applicants would have to show that the traffic island was their "home". The court found that in light of the video footage and other evidence it had at its disposal, the confiscation was undoubtedly unlawful but did not amount to an eviction within the meaning of the applicable legislation. This was because of the ordinary meaning of the words "build" and "structure". Quoting a dictionary definition, the court said a building or structure is a "construction, edifice, erection or other object constructed from several parts or material put together… that has a roof and walls". It went on to say that "to build" involves an act of "putting up, setting together, assembly, creating or manufacture". The Court said that within these definitions, the applicants’ loose materials did not constitute a "structure" and to that end no demolition took place. But the court did not decide whether the act of sleeping habitually at a public thoroughfare constitutes an occupation of land for the purposes of the PIE Act (Prevention of Illegal Eviction Act). The court found that the destruction of the applicants’ property was a violation of their rights to dignity, privacy and to not be arbitrarily deprived of their property. The confiscation process was demeaning and disrespectful. The conduct of the JMPD and municipality was declared unconstitutional and invalid. 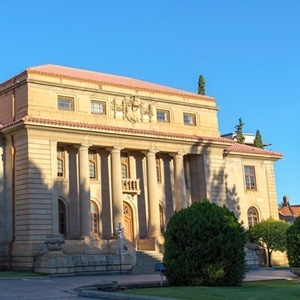 The SCA rejected the high court’s assertion that the applicants should pursue a damages claim, because this would involve costly and time-consuming litigation, which would be inappropriate in light of the value of items which were confiscated. The applicants had no money to go to court and it would not be possible for them to prove the market value of their goods. The court instead ordered the JMPD to compensate each of the applicants by paying them R1500 for the violation of their constitutional rights, especially the destruction of their property. The case upholds the constitutional rights of Johannesburg’s homeless residents and demands accountability from the JMPD and the municipality. The judgment is a recognition of homeless people’s rights to dignity and privacy and opens up the possibility of innovative judicial remedies in future cases.